The Citizens Commission on Human Rights (CCHR) is a non–profit public benefit organization that investigates and exposes psychiatric violations of human rights. It works shoulder–to–shoulder with like–minded groups and individuals who share a common purpose to clean up the field of mental health. It shall continue to do so until abusive and coercive practices committed under the guise of mental health are eradicated and human rights and dignity are returned to all. CCHR’s Board of Advisors, called Commissioners, include doctors, scientists, psychologists, lawyers, legislators, educators, business professionals, celebrities and civil and human rights representatives. CCHR was co–founded in 1969 by Professor Thomas Szasz, Professor of Psychiatry Emeritus, and the Church of Scientology, dedicated solely to eradicate mental health abuse. Click here to download and read the editorial opinion Misguided mental health system needs an overhaul. This searing documentary exposes how devastating—and deadly—psychiatric drugs can be for children and families. Watch the Dead Wrong documentary now online at http://www.cchr.org/. Order the DVD to show to your family and friends. Read the Mental Health Declaration of Human Rights. MedWatch is the U.S. Food and Drug Administration (FDA) program for reporting serious reactions, product quality problems and product use errors with human medical products, such as drugs and medical devices. If you think you or someone in your family has experienced a serious reaction to a psychiatric drug or product, you are encouraged to take the reporting form to your doctor. Your health care provider can provide clinical information based on your medical record that can help us evaluate your report. You will receive an acknowledgement from the FDA after your report is received. You will be personally contacted only if additional information is needed. Please let CCHR St. Louis know if you have completed a MedWatch report. The DSM — a house of cards — an elaborate pseudoscientific sham. 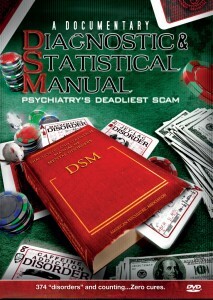 Watch this documentary DVD to find out the shocking truth behind psychiatry’s deadliest scam. Show the DVD to your family, friends, schools, church groups, clubs, etc. They invent the problem. They develop the product. And sell it for billions. The perfect formula for making a killing ... literally. Brutally factual, this 90-minute documentary exposes the greatest financial con this planet has ever seen. The facts are hard to believe, but fatal to ignore. It is a horribly sobering realization that the school shooting spree on April 20, 1999 at Columbine, Colorado, while devastating in its consequences, is only one incident in a tragic trail of incomprehensible acts of mayhem and murder. The nation still feels shock this far removed from this incident, and also from the massacre at Virginia Tech April 16, 2007 by Seung Hui Cho. You need only read a newspaper or watch a television news broadcast to know that schools are not the only place these assaults have taken place. A review of media reports from the last fifteen years reveals that these incidents are also occurring on our highways, in restaurants, post offices, homes and factories from coast to coast. While the number of these incidents continues to escalate, a more disturbing fact is the increasingly bizarre nature of these pointless murders and suicides. Acts of criminal violence have been with us since time immemorial but what we have been witnessing over the last couple of decades staggers the mind and assaults the senses. These grotesque acts, devoid of any possible sense of moral decency, strike us as completely incomprehensible—mothers blowing the brains out of their small children, fathers slashing their young children to pieces, employees “calmly” walking through their offices or factories murdering their co-workers, and young children going on maniacal shooting sprees in school yards. As each new incident is reported, we sit in stunned horror in front of our television sets and wonder what is happening to our way of life. How can we be at the dawn of the twenty-first century with technology hurtling us into a space age future and yet continue to find ourselves without a solution to the escalating number of acts of random, senseless violence? The reason is that we have been fed all manner of wrong reasons for why these tragedies have taken place and so they continue. It is not guns that are the common denominator to these horrific events—some occur with knives, axes and even automobiles. Nor is it clothing, age, gender or political orientation. The fact missed by most is that psychiatric, mind-altering drugs have been found to be the common factor in an overwhelming number of these acts of random senseless violence. These drugs, on an ever increasing rise in society and amongst schoolchildren, particularly over the last two decades, are actually creating acts of violence.